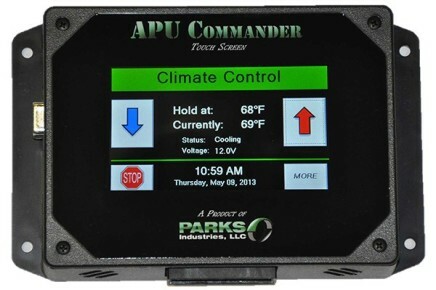 The APU Commander is the most comprehensive, high tech APU control on the market today. Features such as an integrated error log, on the fly Error Code Diagnostics, Calendar Start, Complete System Monitoring and Auto Heat to Cool Climate control makes it appear as if it has arrived from the future! We have listened to the needs of drivers as well as fleet owners to develop the most comprehensive and robust control on the market today. The best part is… it’s affordable! With a touch screen display of only 4”x2” this commander allows you to select your desired battery voltage and temperature, which will allow the APU to heat or cool as necessary without any additional user input. And with the Calendar Start feature you can pre-program your APU to start in a certain mode on any day in the future up to one year in advance! There’s no computer required, and in the event of a problem your APU Commander will alert you with an easy-to-read problem report and description, as well as remind you when it needs serviced. With a touch of a finger the screen will give you suggestions as to what could have caused the problem as well as potential fixes. All errors are saved in an easy to access log giving the APU total transparency and history when taking it to a repair center.